Customer – Who am I targeting? Content – What will I say? Communication – How will I say it? Care – How can I build relationships? Commerce – How can I use social media to make money? Brands need to move away from talking at fans and think more about having conversations with them. So many speakers, including Paul O’Mahony (LeftClickRightClick), Chris Out (Rockboost), Amanda Web (Spiderworking) and myself spoke about the importance of creating customer personas (or avatars). Brands that think they are targeting “everyone” will not succeed. Brands need to go beyond demographic profiling to understand why customers do business with them? What are their hopes and desires? What is their pain to gain? What are the obstacles? And when business is lost to competitors – why is that? Chris Out advised brands to spend a few hours checking out comparable social media pages. What content are they publishing? What is the profile of their top engagers? Amanda Webb recommended xtensio.com/user-persona to help brands identify their ideal customer. Lisa Toner (Hubspot) recommended MakeMyPersona.com. I pointed out that you can use Facebook Insights and Audience Insights in Facebook Ads Manager to learn more about the profile of your existing fans, such as occupation, relationship status, and affinity pages. Conversation is two-way – know who your talking to. When it comes to coming up with content for social media, brands often fall into the pitfall of thinking that content is all about them. It’s not. It’s about the customer. This is where customer personas become useful. Brands need to consider what content they can publish that will be of interest to their customer. When customers find content interesting, they engage, they comment, they tag friends, and they share. This increases brand awareness and moves people through your sales funnel. Niall Harbison from Lovin Dublin said that everybody has to be a publisher in 2017. Content has never been so important. Jamie White from Leading Social echoed this. Chupi Sweetman founder of the award winning jewellery brand Chupi spoke about the importance of storytelling. She uses social media to tell the story of the beautiful things she makes. For Chupi, it’s about the celebration of magic, special things, and love. Paul O’Mahony said that the new currency is attention. Fans are not connecting with you to be sold to, they are there to be entertained. 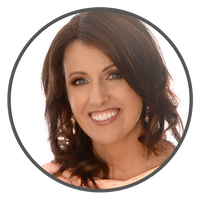 Amanda Webb spoke about creating different types of content based on the sales funnel. Awareness Content is about building brand awareness by attracting the attention of your ideal customer. Interest content is more educational and informative. Lead magnets should be used to grow your mailing list for remarketing purposes. Sales content is about getting your proposition in front of your ideal customer and maximizing conversions. Customer endorsements, reviews, and case studies are used for loyalty content. Now empowered with your customer personas and content plan, it’s time to consider how you can maximize organic reach. Many speakers, including Sarah Cunningham (Adroll), Gregory Owens (Twitter), Cian Corbett (Radical), Mari Smith (the Queen of Facebook!!) and myself spoke about the power of video. Posts with videos get up to 300% more notice in the Facebook newsfeed than text-only posts. Facebook Live broadcasts appear higher in the newsfeed when they are live. Mari Smith said that the Facebook algorithm favors video. In the US, a dedicated video newsfeed is currently being tested. On producing video, Mari recommends drawing the viewer in from the first frame, being authentic and useful with the aim of evoking emotion. Adding captions also makes video posts more successful. She mentions the Lumyer App, which makes photos into videos, and video editing tools like Animoto and Animatron. Krishne De gave some valuable tips for Facebook Live. She recommends that, before getting started, brands should check that they have copyright to use images, music, any visible trade marks as well as the location. When it comes to the quality of the stream, audio is more important than picture – so using a microphone is recommended. Krishne suggested having a battery pack on standby so running out of power doesn’t become an issue. Putting a smart phone on airplane mode during live broadcasts helps avoid disturbances. When shooting videos, use use natural light if possible and avoid a shaky picture by using a tripod, selfie stick or phone holder. I reminded brands to be social when posting on Facebook. What description will encourage audience engagement? How can fans be intrigued to click through to an article, watch a video or look through a series of photos? What other Facebook pages can be tagged? This may encourage them to share content. Think about the timing of posts. When is your audience on Facebook? When do they have them time to engage? I also recommended using Facebook Ads (post engagement/boost post) to kickstart organic reach. How successful this is will depend on the audience selected, the quality of the content, and the post itself (image/video description). Fiona Lee (Littlewoods Ireland), Lisa Toner (Hubspot) and Mari Smith spoke about engaging with influencers to amplify reach. According to Lisa, people don’t trust brands anymore, they trust people. She said that 43% of millennials rank authenticity over content. 3% of individuals in a conversation create 90% of the direction. When identifying influencers to work with, Lisa recommends focusing on customer personas. Why do they follow? Who do they engage with? She suggests that brands that form long-term relationships with influencers achieve a better return on investment. Fiona Lee also spoke about the importance of knowing your audience and what is important to them. She recommends asking customers who they follow. She talked about the advantages of using micro influencers at local level as they often have a more engaged audience. Andrea Finnegan said that, at Air B&B, they don’t just rent out a space, their philosophy is to connect people. This is reflected in their social media strategy. They have built robust care teams globally with the aim of responding and engaging quickly with customers through social media. Their aim is to surprise and delight customers, pick up on any issues quickly and to turn negative situations into positive. With the same theme, Mari Smith spoke about making customers feel unique. She said there is nothing as sweet to someone as the sound of their name. Mari believes it’s time to rethink everything. Social media is no longer about growing likes, it’s about people and relationship marketing. It’s about connecting with people and making them happy by providing stellar social customer care. She said, “When our customers are happy, we make more money.” Mari’s advice to brands is to respond to people, use first names and to signs off posts with the moderator’s first name. 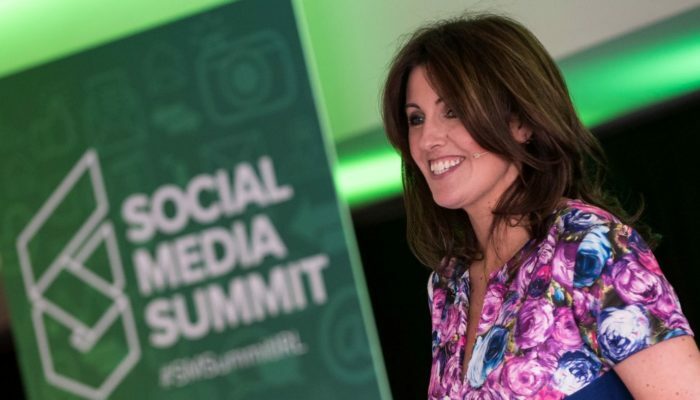 Samantha Kelly (Founder of the Social Media Summit Ireland and Tweeting Goddess Social Media Agency) said success on Twitter is all about relationships and building trust with your followers. She recommends that brands take time to engage with followers and to be authentic. Brands can also build affinity with followers by being helpful, sharing content, and facilitating introductions. Commerce – How can I make money? Brands should never lose sight of the fact that social media is a marketing tool that should be integrated into business plans. Paul O’Mahony spoke about the importance of strategy. He outlined four steps in creating a sales funnel; niche selection, social interaction, online conversion, and optimise monetization. Paul recommends marketing publicly but selling privately. When brands have moved prospects through to the sales stage of your funnel, conversations should be off line. Jacinta Walker (Qualtrics) spoke about the importance of understanding the metrics of each stage of the funnel. She said that 60% of people have made a decision on buying before speaking to a sales person. 27% of prospects have interacted with a brand before visiting its website. She explained why it is critical to produce engaging content as 23% of the buying cycle is conversations with peers and colleagues.